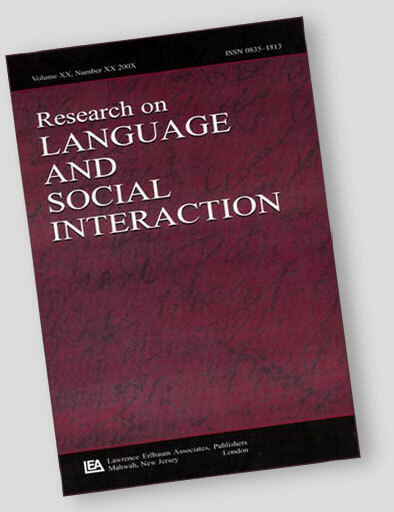 The journal as we know now it started life when Stuart Sigman took Papers in Linguistics over in 1987. He renamed it Research on Language in Interaction, putting out out a double issue on multi-channel codes. Thereafter Robert Sanders took on the responsibilities of Editor (with Sigman staying on as Associate Editor), and widened the network of reviewers and contributors to better capture the field of work implied in the title of the journal. It’s pleasing to note that a number of people on the first ROLSI editorial Board in 1988 are still active supporters of the journal – Robert Craig, Charles Goodwin, Bob Sanders, Emanuel Schegloff, Deborah Tannen and Karen Tracy, for example, are all happily still on the Board. It didn’t take long after the move to publishing interactional research before the success of the journal attracted the interest of an ambitious publisher, and the firm of Lawrence Erlbaum bought the title in 1993. That gave the journal the professional support to publish quarterly. The journal prospered under the continued editorship of Sanders, and thereafter Karen Tracy, Don Zimmerman and most recently Kristine Fitch. Fitch saw Erlbaum taken over by Taylor and Francis, who are now our publishers.The journal has long been international in scope, contributors and readership, and Charles Antaki is the first Editor from outside the USA. The journal, if I may be allowed to blow its own trumpet, is probably one of the most respected in its field. True, the titles of the papers are now less exciting than the days of “Organismic communicology:…”, but their citation counts, at least, are probably higher.